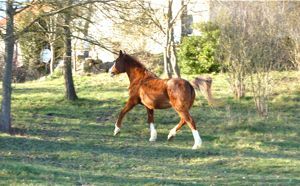 Rimelixa is a purebred Crabbet Arabian with four white socks and a chestnut coat. As she is thirty years old this year, we thought it would be nice to dedicate this newsletter to her long and interesting life. Rimi has been with us for twenty three years now, accompanying us through our learning curve - often steep - and helping to keep a steady ship. 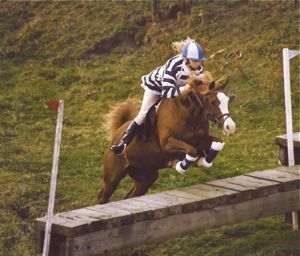 She was my first horse, after Copper my first pony, and I can remember how excited I was to have such an exotic 'fire horse', with such a beautiful Arabian head and fiery temperament. After some development of our relationship, we competed in the Working Arab classes at shows, and she even went along with my desire to event. At least until it came to tackling the water jumps! We didn't listen to what people told us about Arabs, we were a jumping partnership. We had fun doing interval training and less fun being a flop at showing. Rimi was too relaxed and sensible to do well, and getting her to mess about on purpose seemed a bit ridiculous. Rimi taught me that respect from a horse must be earned without force or losing one's temper. She taught me how important it is to concentrate when riding, and that it is only fair to expect from a horse what one is capable of achieving as a rider. She never put me in danger, and the rapport I had with her inspired me to search for the same communication with all horses I meet. I think the most important thing Rimi has shown us all at HHT is the joy and fulfillment it is possible to get out of paying your debts to the horses who have given us so much and shared so much of our lives. 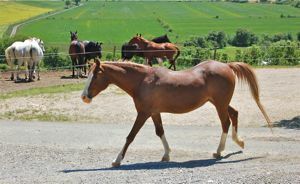 A few times along the way we tried to find good loan homes for her, because she was getting older and her place could be filled by another younger horse. The first time we did everything 'correctly', we had a signed copy of all the conditions Rimi was to be kept in, and we delivered her with all her best rugs and even a favourite book about Lady Wentworth's Arabians, many of which were Rimi's distant relatives. About 9 months later I persuaded a friend to help me find her and rescue her, because the woman we had entrusted her to turned out to be an alcoholic who's daughter wanted to be paid to look after her, but would not agree to give her back. Unfortunately we never saw the book or the rugs again, but it wasn't much to pay to have Rimi herself safely back home. After another bad experience where she came back like a hat-rack from someone who had been much recommended, we stopped looking to loan her out. 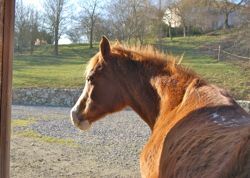 We brought her back to health and then here to France, but after a good start, the difference in the climate and diet started to take its toll. In Scotland horses seem to thrive on the rich, green grass. We have since discovered this kind of grazing is unnatural and unhealthy and results in chronic health problems, but it took us a while to sophisticate our nutrition here, and after Rimi lost one of her oldest equine friends, she also lost some teeth and a lot of weight. Her metabolism had never fully recovered from the malnutrition she had suffered when on loan in Scotland, and it was more difficult to keep her weight on than before. She can't eat hay now, or rough grass, but she loves her luzerne, copra and crushed oats mix three times a day, and the occasional apple or orange. This year coming out of the winter she has rarely looked better. Round about this time, she was having a dental check up and was given too much sedative. She went down and it looked like all the life had left her body. We were all surprised when she got back up again. We call it her 'near-death experience', and since that time she has a different outlook on life. She does her own thing, and shutting her in a stable or even a field are out of the question. She has become liberated in her mind which reflects itself in her lifestyle. She has befriended the foals and some days she can be found talking to them, no doubt telling them about her own exploits as a young filly in the show ring! Other times she will be grazing round the pool or stealing fruit in the garden. She visits each herd now and then, and very occasionally comes down to the arena to watch what we are doing. We are glad now that we stopped trying to give someone else the responsibility for her life, and although we have more horses than ever, Rimi's place is a blessing. Rimi this spring, still going strong at 30. 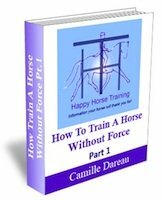 The first part in HHT's Training series: How To Train A Horse Without Force. 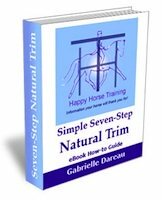 This quality e-book gives you a unique holistic understanding of training horses, from the very first contact with a young horse, through to a thoroughly explained method of lunging that is beneficial for any horse at any stage of training. These two e-books, comprising more than 75 thousand words and richly illustrated, are available for only 19.99 Euros (around $26). Click here for more details.